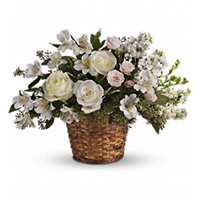 Provide comfort for the family of Janice Walters with a meaningful gesture of sympathy. Special thank you to friends and neighbours for their support. Special heartfelt thank you to nurses, 4 th floor oncology – Victoria Hospital for special care and compassion. The nurses from St. Elizabeth and SW Lin, Oxford County Palliative Care, Janice’s on-going care at home. A very special thank you to our life-long friends who have been there through thick and thin with us. Joanne Grandville and Marie Finch. Thinking of Jason and his family. Your friends at 291 Construtiion. 291 Construction purchased the Love's Journey for the family of Janice Walters. Janice, you were a great co-worker (we had many ups and downs, in our 21 years there together and also, a lot of laughs, as we shared the same sense of humour towards people) and friend. You will be missed and remembered fondly. Janis was one of the very first to be kind to the young, unsure employee that I was when I first started working at maple leaf. I always have held her in the highest of regards, and will miss her dearly. My thoughts and prayers are with all her dearest friends and family.